Happy Halloween! I remember back when I was in elementary school, all my friends would dress up on the last day of the tenth month. They would don the mask from superheroes like Batman or Spiderman, or put on the furry paws of animals like cats or dogs. I even remember my friend making a Blastoise (The final evolution of the first generation water starter Pokemon, Squirtle) costume. I always remember Halloween as a good day of treats, and a day of dropping everything school related to do things Halloween related. As I have grown up from those times, the days of free candy and dressing up are mostly gone. Now the best part of Halloween is the day after, or November 1st, because of the cheap candy on sale after Halloween. Most stores are trying to get rid of their stock, especially with Christmas around the corner, so they hack and slash prices to empty their valuable shelf space. And that, my friends, is the best day to actually do your Trick or Treating. Within twenty four hours of the event, boxes and boxes of candy drop by fifty, sixty and even eighty percent in price. This only seems natural as no one will be purchasing large amounts of candy until the next October 31. The only way that stores can clear through stock is to reduce the price. Thus poor students like myself love to take advantage of these clearance deals. When we turn our heads to the solid state drive market, however, we see a different situation. There is no lack of demand for solid state drives, as people are reaping the benefits of speed increases, but the prices continue to steadily decline. Rather than trying to counter a decreasing demand, manufacturers have been releasing new lines of solid state drives at lower prices to increase the scope of their audience. Nowadays, SSDs can be found below the $1/GB mark. But when OCZ released the ARC 100 series, it took this decline to a completely different level with a MSRP of only $0.43/GB, which begs me to wonder if there are any performance trade-offs. 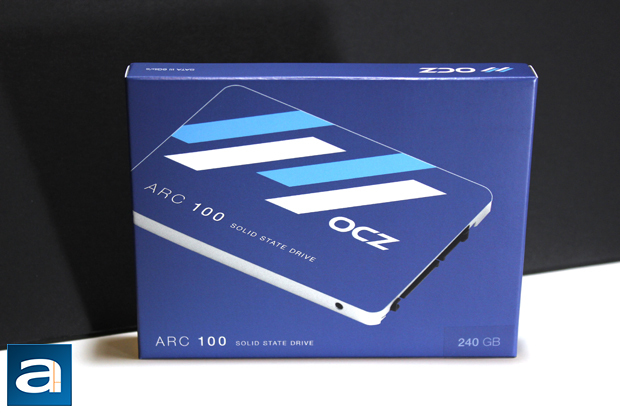 We have seen past OCZ drives with generally good results, so where does the ARC 100 fit in? Let's read on to find out! 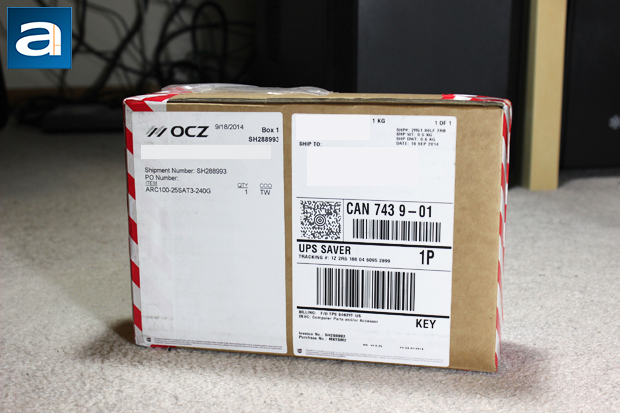 Today's review unit of the OCZ ARC 100 240GB arrived in a very small, standard brown corrugated cardboard box. The sides were taped with bright red and white tape, which makes it obvious if someone had tampered with our shipment. With the help of UPS Saver, our parcel traveled all the way from Taiwan to our APH Networks Calgary location. Amazingly though, there are no dents or holes in the box, which is a good thing considering it traveled well OVER 9000 kilometers! Luckily it does not take a Kamehameha to open this box, and I instead grabbed my nearest utility knife to crack this package open. 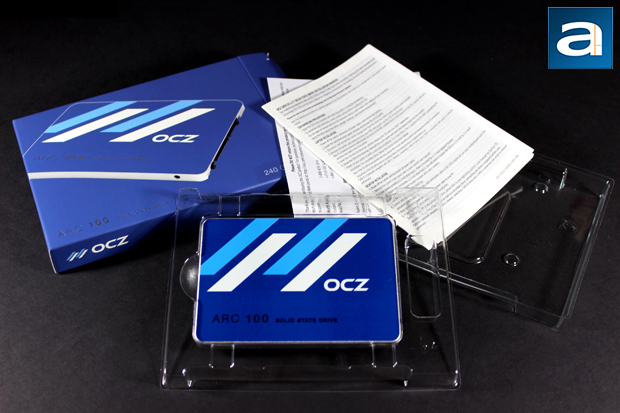 Inside the retail container of the OCZ ARC 100 240GB is unlike any of the past OCZ SSDs we have received before. Rather than a standard black container, there is actually a clear plastic shell that holds the SSD. There are some reading material about RMA information and installation instructions too. Otherwise, that is it. There are no CDs or stickers about speed or love of solid state drives. There is not even an a 3.5" adapter bracket, 9mm adapter, or even a set of screws. While the underwhelming amount of accessories is understandable considering the price point of the ARC 100, it is slightly disappointing they could not include cheap things like a plastic frame to fit larger slots. With the lack of any extras, let's take a closer look at the drive itself. posted 13 hours and 7 minutes ago, with 58 posts.